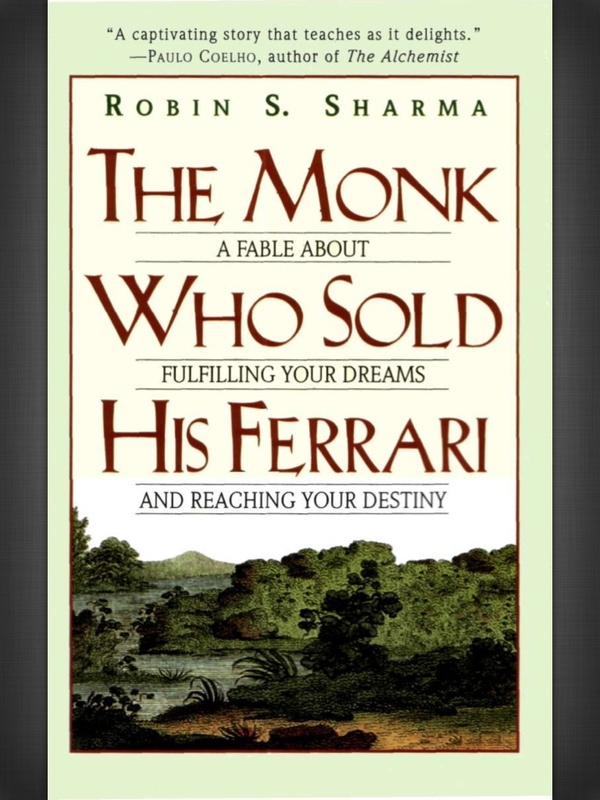 I just finished reading one of the most inspirational and eye-opening books ever – The Monk Who Sold His Ferrari: A Fable About Fulfilling Your Dreams & Reaching Your Destiny by Robin Sharma. It is a motivational step-by-step guide how to live life to the fullest, make your dreams come true and be happy by achieving inner peace and finding your purpose in life. I can’t even begin to describe you how deeply I was shaken by the simple (and often too obvious to see, yeah get the paradox) truths that are in there. I’m bewildered at the amount of wisdom and the power of motivation I plucked up while reading the book. But don’t take my words for it, read on and see if the resume I wrote is something you’d be interested in. It’s important to point out that it’s not so much of a resume as it is a collection of all the precious advice and tips I found inspirational in the book. So do you want to be inspired too? The Monk Who Sold His Ferrari opens with the story of Julian Mantle – a top lawyer from New York, who is also a millionaire, has a private jet, owns an island and a Ferrari and is fearless in the court room. He lives a fast unhealthy life, spends a lot of money, works non-stop, sleeps only very little. But life has a surprise for Julian – after having a heart attack he is forced to confront the spiritual crisis of his out-of-balance life, and the subsequent wisdom that he gains on a life-changing odyssey to the East enables him to create a life of passion, purpose and peace. The storyteller, John starts sharing the amazing experience of meeting Julian years after he went on his spiritual journey to India and the Himalayas. At first he can’t recognize him – Julian looks younger, fitter, with glowing skin, a wide smile and great vitality. As his duty Julian starts telling John all the secrets that led him to change his mind, life, body and spirit. “I have learned that self-mastery and the consistent care of one’s mind, body and soul are essential to finding one’s highest self and living the life of one’s dreams. How can you care for others if you cannot even care for yourself? How can you do good if you don’t even feel good? I can’t love you if I cannot love myself,” says the former lawyer. All his wisdom he’s gathered from the Sages of Sivana – monks who live high up in the Himalayas. The main idea is that a person can be happy, when he is peaceful, and a person is peaceful when he is not worried or sad. Worries come when people think too much about the future and what might or might not happen. And sadness comes when people linger too much in the past and what happened, could’ve happened or should’ve happened. This makes me think of a blog post I wrote a while ago: Live in the present, be in the moment. To be really peaceful and in touch with your inner motivation you have to find your passion and dedicate your time and effort to it. It will repay with great fruits, energy and even more motivation. How to achieve that? The lawyer-become-monk Julian has a few techniques up his sleeve. The trick here is to get a rose – the rose represents life – it can be pretty and nice like the petals or rough and painful like the thorns. Odd as it may sound, the technique requires a person to stare at the rose for a few minutes every day (each day add a minute or two on top of the minutes you spent looking at the rose last day). While looking at the flower, try to focus and think only about it and when you feel your mind has wandered gently bring the attention back to the rose. After 2 weeks you should be able to look at the flower for about 20 minutes without other thoughts troubling your mind. Just find power in silence and stillness. A restless body is a sign of a weak mind. Something else I can personally recommend for mindfulness is this great app by Andy Puddicombe – Headspace. It has a free ten 10-minute sessions – you can try and see if it fits for you. Take a few minutes every day to envision the things you want to achieve, the dreams you want to come true. You can even say out loud positive affirmations – mantras. Try to imagine how you would look and feel when you’ve already achieved that dream and hold onto that feeling. Here I can recommend another book on the power of the mind: Mind Power Into the 21st Century by John Kehoe. Cultivate your mind – it will blossom beyond your expectations. Remember that the quality of your life is determined by the quality of your thoughts. Keep the garden of your mind fresh and green by thinking only positive thoughts. There are no mistakes – only lessons. See setbacks as opportunities for personal expansion and spiritual growth. The advice and tips from the monk who sold his Ferrari are not over yet. On the contrary. Here are the steps to reaching your objectives in life. And don’t forget to find your Dharma (purpose of life). The purpose of life is a life of purpose. A good idea is to write all your goals and dreams in a journal. Divide them in sections for the different ares of your life – professional, spiritual, material, social, etc. You can even put pictures of the things you want to achieve or the people you admire/who have accomplished what you want in life. For new behavior to crystallize into a habit, one have to perform the new activity for 21 days in a row. Live, laugh, love. Every moment is a gift. All living things possess exquisite beauty. Remain spirited, joyful, curious. Stay focused on your lifework and on giving selfless service to others. The Universe will take care of everything else. There is no chaos in the Universe. There is a purpose for everything that has happened to you and everything that will happen to you. Every experience offers lessons. So stop majoring in minor things. Enjoy your life. Bonus: Practice kaizen – constant and never-ending improvement. Find out what your fears are and face them as they rise. Julian, the monk who sold his Ferrari, advises that those 10 rituals must be applied for 30 days in a row if a person wants to see the result of them. The Ritual of Solitude – This is a period of time between 15 and 50 minutes a day wherein you explore the healing power of silence and come to know who you really are. Solitude and quiet connects you to your creative source and releases the limitless intelligence of the Universe. You’ll sleep better, enjoy a renewed feeling of balance in your day-to-day activities. You could do this anywhere quiet and you can add a nice bouquet around you to look at. Or you can do as Julian – make a Sanctuary of the Silence – a quiet space just for you for mental and spiritual expansion. The Ritual of Physicality – You should care and prepare your body as you do your mind. Ger your blood circulating and your body moving. At least 5 hours a week should be spent doing physical exercise. Yoga is a particularly good choice. It unlocks your reserves of vitality. Vigorous walking in natural surroundings is good as well. Also breathing in the right way is extremely important – breathe from your stomach. Your belly should go up and down when you inhale and exhale. The Ritual of Live Nourishment – This ritual praises vegetarian meals, but it doesn’t necessarily mean you should give up meat. The main idea is to avoid eating dead things, especially red meat, but to focus on food such as fruit and vegetables, nuts, etc. Read for at least 30 minutes a day. Study your books, don’t just go through them. The answers to your problems have already been printed by those before you. All the mistakes you will ever make in your life have already been made by those that have walked before you. Recommended readings are: The Biography of Benjamin Franklin, The Story of My Experiments with Truth by Mahatma Gandhi, Siddhartha by Hermann Hesse, the practical philosophy of Marcus Aurelius, Seneca, Think and Grow Rich by Napoleon Hill. The Ritual of Personal Reflection – Think about what you did and how you reacted every day. Try to evaluate what you did wrong so you can do the right thing next time an opportunity presents itself. Don’t eat after 8 p.m. as the digestive systems requires a lot of energy and leaves you restless throughout the night. Sunbathe occasionally as the sun can be very rejuvenating. The 10-minute period before you fall asleep and the 10-minute period after you wake up are profoundly influential on your subconscious mind. Only the most inspiring and serene thoughts should be programmed into your mind at those times, so think positive thoughts. You can go into your Sanctuary of silence and think “What would I do today if today was my last?” Mentally list all the things you would do, the people you’d call, the moments you’d savor. Envision doing these things with great energy. When you live every day as if it was your last, your life will take on a magical quality. The Ritual of Music – This is pretty self-explanatory – listen to music that makes you feel great, play an instrument if you can, as music transcends us to a higher place. The Ritual of the Spoken Word – Mantras – a collection of words, strung together to create a positive effect. Literally, mantra = mind feeling. Use mantras to fight negative thoughts and as affirmation to your qualities and the power of your mind and dreams. Remember that your self-image is a self-fulfilling prophecy of sorts. When you change your inner world, you change your outer world. The Ritual of a Congruent Character – Take daily, incremental action to build your character. Your character affects the way you see yourself and the actions you take. Those actions come together to form your habits. And your habits lead you to your destiny. There are 6 important principles for living a meaningful life: industry, compassion, humility, patience, honesty and courage. When all your actions are congruent and aligned with these principles, you will feel a deep sense of inner harmony and peace. The Ritual of Simplicity – Live a simple life and cut down your needs. Otherwise your always growing needs and expectations will never meet reality. Always be brave. Stand your ground and follow your dreams. They will lead you to your destiny, it will lead you into the wonders of the Universe. And always follow the wonders of the Universe for they will lead you to a special garden filled with roses. Many people don’t realize that actually the ones who fulfill their dreams and never give up are the people who are disciplined enough to do so. The people who have strong willpower. Willpower is important for building a strong character and finding true freedom. Self-control pretty much means excellent mind control. When you control your thoughts, you control your mind. When you control your mind, you control your life. And once you reach the stage of being in total control of your life, you become the master of your destiny. Will is the king of mental powers. When you master your mind, you master your life. Mental mastery starts with being able to control every thought that you think. When you have developed the ability to discard all weak thoughts and focus only on those that are positive and good, positive and good actions will follow. Soon you will start attracting all that is positive and good into your life. As it’s already been pointed out, positive mantras are extremely powerful. One mantra that you can repeat is: “I am more than I appear to be, all the world’s strength and power rests inside me.” The requirement is that you repeat it at least 30 times a day. For quicker results: envision it. Go to a quiet place, sit with your eyes closed, don’t let your mind wander. Keep your body still as the surest sign of a weak mind is a body that cannot rest. Repeat the mantra aloud over and over again. Envision yourself as a disciplined, firm person fully in control of your body, mind and spirit. How else can you cultivate willpower? You know all those things you avoid doing – snoozing the alarm button in the morning, eating just one more cookie, doing your homework tomorrow and so on and so on. Well, start doing them. You’ll feel better after you’ve done the right thing and done your job. And on top of that you’ll be training yourself discipline. There is one more trick in the book – taking a vow of silence for a day. You can only respond to direct questions. This is a perfect exercise for your mind power and discipline. Truly enlightened people are priority driven. Don’t let other steal your time as it is your most precious resource. You can’t get it back and you certainly can’t buy it. Happiness can be reached only by those who are effective and set definite aims for themselves. Laughter is the best remedy – it opens your heart and soothes your soul. No one should ever take life so seriously that they forget to laugh at themselves. Cherish and nurture your friendships. If you have 3 true friends you can rely on, then you’re immensely wealthy. The quality of your life directly corresponds to the quality of the contribution you make. Less selfish, more selfless. Helping others elevates your life quality (you’ve heard of good karma, right?). As cliché as it may sound, happiness is a journey, not a destination. Enjoy the process, enjoy every day as you progress through it. Don’t forget to stay mindful and focus on the present. The past is water under the bridge and the future is a distant sun on the horizon of your imagination. The most important moment is now. Learn to live in it and savor it fully. Never forget the gift of family and having someone to come home to and to seek love and support from. Cherish your family and help them, for they would do the same for you. There is a huge difference between making a lot of money and making a lot of life. Which one will you remember on your last day? What will you regret not doing at the end of your life? Think about that and try to avoid those regrets by doing those things today. Express gratitude. Daily thank for all your assets (material and spiritual). This will help you live in the moment and attract more positive experience, energy and sense of appreciation into your life. We are all here for some special reason. Meditate on what your true calling is, and how you can give of yourself to others. Stop being a prisoner of gravity. Today, light your spark of life and let it blaze brightly. Start applying the principles and strategies that I have shared with you. Be all that you can be. A time will come when you too will taste the fruits of that place called Nirvana. How do you feel after reading all this? Are you inspired, motivated or just pessimistic? Are you going to read Sharma‘s The Monk Who Sold His Ferrari? Or perhaps you’ve already read it? Let me know what you think in the comments below or by contacting me. Let me start off by saying, This was a superb summary of the book! Literally just finished the book and wanted to see what other people thought of it. I first heard of Robin through running across his “5 A.M. Club” video on Youtube and it improved my work drastically. Picked up this book and “The Leader Who Had No Title” on Amazon about a month ago and I cannot wait to start the next book. Obviously, it is too soon to see if the book has made any huge lasting effects, but over the course of the two weeks to read this book I have noticed a few differences in my lifestyle that have improved my overall well-being. First, I’ve picked up meditation before I go to sleep. Some nights all it really does is make the “head fog” disappear, but on the deeper nights I’ve brought myself to places that really make a euphoric feeling. I’ve cut down on my partying and alcohol to half the amount because I realize I cannot become the person I envision myself being with that lifestyle (not to mention the low productivity level during a hangover). Unfortunately, it is summer break for me right now so I cannot apply these new virtues to a productive period immediately. My confidence and excitement in doing so are definitely present for this coming semester. Anyway, I’d love to hear the effect (or lack of) this book has made for you since this original post. It’s nice to see a reaction similar to mine! Thank you for your comment! I’m really glad there are other people out there who were touched by “The Monk Who Sold His Ferrari”. To be honest, I haven’t incorporated all of the things I’ve listed in this post yet (like a daily journal with all my goals and dreams), but a few things I’ve started doing and they’ve led me to meet people with the same mindset and the same aim in life – personal growth, following the purpose of your life and finding inner peace and harmony. As a whole, this book changed the way I see things. I mean, a lot of the things are mostly common sense and a lot of people know them, but they don’t realize them. I think I’m going beyond knowledge and into realization. Meditation has helped me a great deal in that aspect. As I see, it has a positive effect on you as well. I watched the 5 am club video as well, and I’m still preparing to make that step – to try and go to bed at 10 pm, so that I can get up at 5 am and go about my goals. Have you taken this up or are you still preparing like me? Did you finish “The Leader Who Had No Title” and if yes, what did you think of it? During summer break, I try to be up by 8 a.m. and doing something somewhat productive. I find it difficult to do the 5 am club routine with practically nothing to do for the day. So I really just get up early and get my daily reading or exercise done for the day. During the semester, especially in the busier weeks, this morning procedure works wonders. In times of times of a great workload and stress, I would highly recommend this concept doing EVERYTHING the video says to do. I have a notecard with the 20/20/20 rules taped down to my desk. I finished “The Leader Who Had No Title” a few days ago, and i personally liked it a little better. It was much more practical and less hippy-dippy Sages of Sivana. I would argue that he takes the concepts of TMWSHF and put a Western business spin on it. Me having a retail job like the main character in the book, made the concepts very useful. If you read it, my personal favorite lessons were the first and fourth. I also noticed while reading these two books that most of his videos that he posts are small points extracted from the books and elaborated upon. Ok, so the 5 am club is difficult not only for me. What about yoga – do you practice? I’m asking since you said you meditate before going to bed, and to me the two things are somewhat related. I guess the next book on my reading list will be “The Leader Who Had No Title” then. I was somewhat reserved towards it, I’m not sure why, but I plan to read it after your recommendation. Thanks for the tip! Seriously its awesome summary. I read this book 6 months before and after reading your thoughts and views toward this book I feel like I just finished that book again in a few minute.